ASP National President Mona Veluz conducted the Batch 7 of the New Members and Volunteers Orientation at the Autism Society Philippines National Headquarters last 13 May 2017. As with each orientation, the event was open to all. Parents, professionals, students and persons with autism spent their morning challenging what they thought they knew about autism -- the myths and the realities. Disability-friendly language is also one of the key parts of the discussions. What do you call someone with an autism diagnosis -- autistic or person with autism? What do you call someone without autism? There are some of the many questions answered during the section of advocacy language. The empathy exercise simulating communication processing disorders was extra fun. Jumping north, west, east and south, the game felt more like a strange “Simon Says” than an exercise that will help one understand what it is like to have autism. Ms. Mona also explained the many projects that the Autism Society Philippines has kicked off. 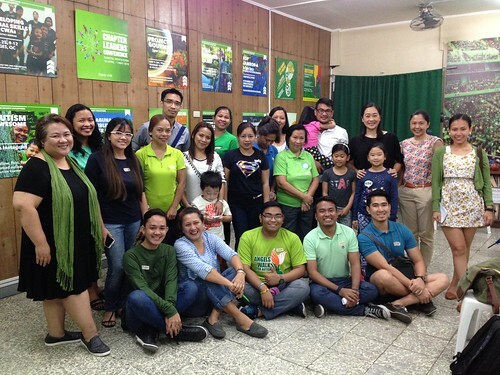 As new members and volunteers, the participants are encouraged to find their niche and assess for themselves how to best help the autism advocacy in the country. Do you want to volunteer for ASP events? Search "ASP Angel Corps" on Facebook and sign up.